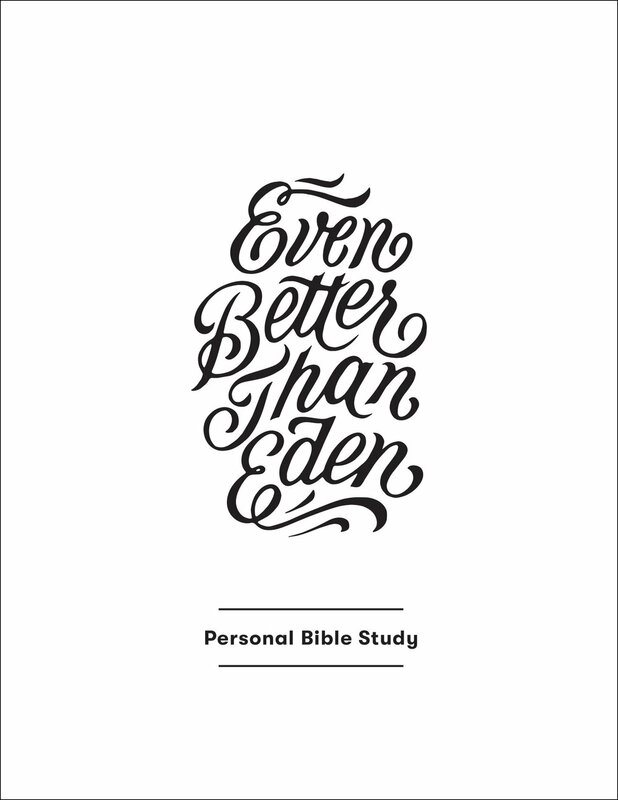 The Personal Bible Study for Even Better Than Eden includes questions on the biblical text that correspond with each chapter of the book. Rather than including questions in the printed book, the questions have been formatted to be copied onto 8.5 x 11 paper and three-hole punched for placement in a 3-ring binder. We’ve designed the questions with a generous amount of space in which to record answers. It is a total of 39 pages in length. of participants for what will be read in the chapters or watch on the video, providing each participant with the needed background and foundation for ideas and passages that may be presented only briefly in the chapter or session. In other words, participants will get a whole lot more out of reading the chapters or watching the video teaching if they have worked through these questions first. The Even Better Than Eden book includes a Discussion Guide in the back of the book that provides suggested questions for discussing the themes presented in each chapter and the implications of the truths. These are not the same as the questions in the Personal Bible Study. A sample of the Personal Bible Study Questions can be found here. When you place your order, you are purchasing access to a downloadable PDF and a license to make only the specific number of copies you paid for. When you place your order for this Leader’s Guide, you are not purchasing a physical product that will be shipped to you. You are purchasing a PDF for an 81-page document you will be able to download and print. The pages are formatted to be printed onto 8.5 x 11 paper and three-hole punched to be put into a notebook. Upon purchase you will be sent a link to download this pdf. When you download this file, you are not being granted the right to make multiple copies. You are being granted a license to make only one copy of this Leader’s Guide. You are not being granted the right to forward this downloaded PDF to anyone else. If more than one person will be using this Leader’s Guide, we require that you purchase a copy for each leader. This Leader’s Guide should never be forwarded to or copied for each of the participants in your group. Important: The link to the download of the Leader's Guide will expire 24 hours after it is sent. So be sure to fully download the Leader's Guide upon purchase before the link expires. This workshop on Even Better Than Eden: How the Bible’s Story Changes Everything About Your Story with Nancy Guthrie was recorded at The Gospel Coalition’s 2018 Women’s Conference in Indianapolis, Indiana.